They may look innocent enough but these two felines are responsible for a mini crime spree in the east of England. Christmas is a gift for Theo, a three-year-old Siamese cross belonging to Rachael Drouet and Paul Edwards from Ipswich. He is a seasoned cat burglar, regularly bringing home "treasures" from neighbours' houses. But this year, Theo has really got into the spirit of Christmas. He has forsaken his usual diet of clothing, phone chargers and other cats' toys for a selection of Christmas decorations which his owners believe he is pilfering from their neighbours' trees. Meanwhile, in Luton, Denis, a three-year-old moggy whose cat burgling antics have been well-documented on Facebook, Twitter and YouTube, is expected to get into the Christmas spirit once the big day is over, according to his owner Lesley Newman. She said her cat prefers to steal underwear, but usually brings home gifts of Christmas wrapping paper - minus the contents - after the big day. Cat biologist and behaviourist Roger Tabor has met Denis and monitored his movements to try to get to the bottom of his curious habit. "The first thing to say about 'cat burgling cats' - ones that take home assorted unusual non-prey items on a regular basis - is that this is a rare activity," he says. Many cats bring home "trophies", he says, but these are usually food they have scavenged from bins. "The real cat burglars are those that regularly bring back an assortment of human-associated objects including bras and other clothing, sponges, towels, flip-flops and paint brushes," Mr Tabor says. Denis's penchant for purloining pants is matched by his love of shoes, paintbrushes and Barbie dolls. Mrs Newman believes Denis climbs up neighbours' rotary washing lines and pulls items of clothing off before carrying them home through his cat flap. After trying, and failing, to find the owners of most items, Mrs Newman now keeps a large box of Denis's finds in her loft. 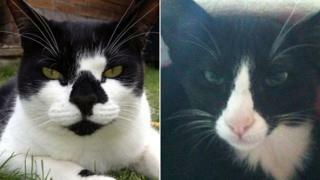 Returning their cats' stolen goods to the rightful owner is a challenge for both sets of owners. Pleas on Facebook go largely unanswered and confronting possible "victims" is not always easy. "It's a bit embarrassing to have to knock on neighbours' doors - especially the ones I don't know so well - and ask them if this chewed up thing covered in saliva and cat hair was once hanging on their Christmas tree," Miss Drouet says. Theo's latest finds include woollen Santa and snowman decorations - clearly from the same set - and an angel which he brought into the kitchen and quickly separated it from its feather "wings". Miss Drouet says while she appreciates Theo's gifts, she would "prefer an iPad". She believes his cat burgling is the nearest her pet can get to catching live animals. "The thing is, Theo's absolutely rubbish at catching normal 'cat prey'," she says. Image caption Lesley Newman believes this is how Denis acquires most of his "treasures"
"He's really a bit of a stupid cat, and definitely not firing on all cylinders to be honest. "He's got a real thing about rubber and latex gloves. He seems to have some strange fetishes." She adds: "Usually he takes a break over the winter, preferring to spend up to 22 hours on the sofa, so we thought we were home free. "Then in the space of a few days these Christmas decorations appeared." Denis also shows no sign of giving up his life of crime, which he has been perfecting since he was a kitten. "He never brings home prey, just the other things he takes a fancy to and I really don't think he's ever going to stop," Mrs Newman says. She says she makes up for Denis's criminal ways by donating money from advertisements on his YouTube channel to a cat rescue charity in Bedfordshire. Image caption Theo is caught bringing home another cat's toy while Denis plays "innocent"
"He's raised about £5,000 for them so far," she says proudly. Mrs Newman says she is waiting for Denis to bring home some jewellery. "I'll be happy as Larry if he does that," she says. "But he's definitely gearing up for Christmas and has brought quite a few things home this week. "Bless his cotton socks. He's so proud of his 'finds'."